Aluna is featured in various publications at a local, regional and national level. Get a glimpse at what others have to say about Aluna and its capabilities. 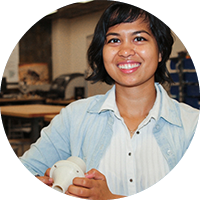 For [Charvi Shetty's] senior design project in bioengineering, she built a device for asthma patients. "...A big part of the problem is that kids have a hard time communicating how they’re feeling." Imagine your chest tightening as you struggle for for breath. There’s no cure for it, and it will most likely be a hindrance to your day-to-day life. In 2014, Charvi founded KNOX medical diagnostics. KNOX has developed a revolutionary cloud-connected portable spirometer for asthmatic children. When a child with asthma goes to the doctor, he or she can breathe into a device that tests lung strength. By taking a common asthma testing tool out of the hospital, this San Francisco-based company wants to break down medical barriers and help kids breathe better. Charvi Shetty’s (B.S.’12 BioE, M.S. ’13 UCSF biomedical imaging) efforts to build a better asthma monitoring tool recently became personal. Knox was relentless about understanding whether their device was a business or whether it was technology in search of a market. Aluna is not currently for sale. All specifications and descriptions provided herein may be different from the actual specifications and descriptions for the product. Aluna reserves the right to make changes to this document and the product described herein, at anytime, without obligation on Aluna to provide notification of such change. All functionality, features, specifications, GUI and other product information provided in this document including, but not limited to, the benefits, design, pricing, components, performance, availability, and capabilities of the product are subject to change without notice or obligation. The contents within the screen are simulated images and are for illustration purposes only.